Down and out. Rory McIlroy loses to 17-year old Brad Dalke in arm wrestling. Still has the edge in golf mind you. Pádraig Harrington reckons Rory McIlroy has the time and the ability to to win as many majors as Jack Nicklaus. But he also reckons the Northern Ireland star needs to rack up the wins quickly before the next generation of power athletes hits the golf course. The powerfully built teenager, who had a verbal agreement with Oklahoma University from the age of 12, lists "working out" as one of his hobbies in his profile for the US Junior Ryder Cup team. After agreeing to an arm wrestle, McIlroy saw Dalke's bulging bicep, touched it and said, "Look at this.... no chance." 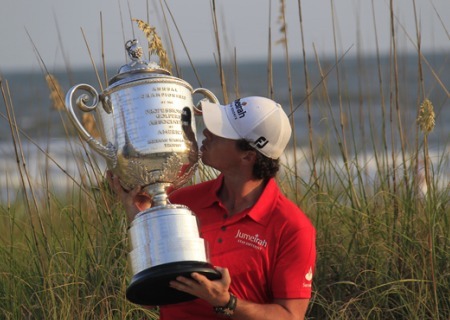 He was right as Dalke won easily and posted the video on Twitter with the note, "Sorry Rory." "Jesus Christ is my Lord, Savior, and Best Friend. Oklahoma Golf '19". Dale opened with an 85 at Sage Valley so he might not be the kind of player that Harrington believes could give McIlroy trouble in a few years' time. "He seems to have stolen a little bit of a march on the other players at the moment. He drives the ball ever so well and it gives him tremendous confidence. "I see that dominace in a few years' time not being as prevalent becuase of the fact the younger guys coming out are going to see him and learn from him and catch up with him, as we all did with Tiger. "But at the moment I think he is the dominant player and I do believe he will win many more majors, but the quicker the better. There will be plenty of good players coming around the corner." Harrington spoke about the new generation back in May and the arrival of players who will be driving the ball more than 360 yards in the next few years, leaving McIlroy and Bubba Watson in their wake. "The good thing about (Rory and Bubba) is that when they play well, they can win and win within themselves There are other guys who need to play well and have things go right for them on top of that. “That’s the way the modern game is going. In 10 years’ time there will be 30 guys on the tour that will hit the ball as far as Bubba and way past what he does. They grow up hitting the golf ball hard with the modern equipment, trying to get distance. "Bubba’s ball speed is up there in the high 180s, but there are guys who can get it up to around 200 ball speed. So you are going to get guys who are going to be able to hit it …… let’s see…. 30 yards past Bubba. Harrington on Rory's break up: "It was a big decision, a brave decision"
Pádraig Harrington has hailed Rory McIlroy for his "bravery" in cancelling his wedding plans with Caroline Wozniacki at the 11th hour. Harrington sees McIlroy capable of winning 18 majors: "Time appears to have caught up with Tiger Woods and we just wouldn’t have foreseen that a few years ago"
Rory McIlroy can match Jack Nicklaus’ haul of 18 major but Pádraig Harrington has warned the new Open champion that he must strike while the iron is hot and take advantage of his best years.